Learn about Big Brothers Big Sisters of Cape Cod on Wednesday at the Sandwich Public Library – 6pm-8pm. 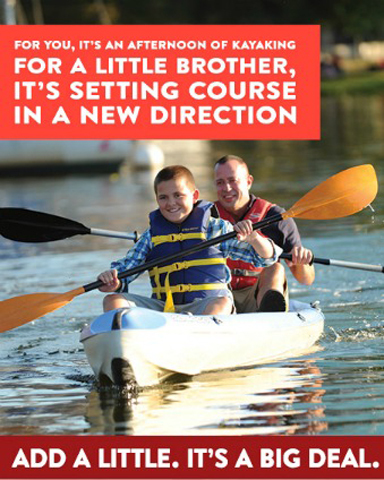 Big Brothers Big Sisters of Cape Cod and the Islands: Volunteer or Enroll a Child Today! At Big Brothers Big Sisters of Cape Cod & the Islands, adult volunteers (Big Brothers and Big Sisters) are matched with a child between the ages of 7 and 12 (Little Brothers and Little Sisters) in their community. As part of one of the largest adult-to-child mentoring organizations in the nation, their mission is to promote the healthy development of children through the nurturing of continuing, one-to-one friendships with caring, responsible adult volunteers. Being a Big Brother or Big Sister just a few hours a month, you can have a forever impact on the life of a child living on Cape Cod. Many people think that being a Big Brother or Big Sister requires great expense or a weekly commitment. This is not true! Some children want to participate in outings with their Big, such as going to the movies or the beach, while others thrive simply by getting one-on-one attention through a game of catch in the backyard, cooking a meal, or working on a puzzle together. Volunteers not only give back, they also receive a number of personal and practical benefits. Below are some of the top reasons to consider becoming a volunteer Big Brother or Big Sister. On average, those who volunteer report being happier, healthier, and less stressed than their non-volunteering peers. Volunteering can lead to more fulfilment in life and increased productivity at work, because those who feel good do good! Invest in our community’s future by providing the volunteers and children enrolled in this program with an enriching, meaningful mentor/mentee relationship. Mentoring has been proven to help students stay in school long enough to earn a diploma and to succeed both professionally and personally beyond graduation. Volunteering can help you get inspired! Maybe you’re looking to break up your daily routine, to explore a new passion, or even to consider a career change. Volunteering is a great avenue for gaining new experiences and skills, or test-driving a new field. If you’ve ever wondered what it may be like to work in non-profit, education, community development, or human services, then volunteering at Big Brothers Big Sisters is a great way to get your foot in the door. In the past five years, the Cape & Islands has seen a 65% increase in families living at or below the poverty level—the highest increase in the state. Additionally, there are more than 2800 children between the ages of 7 and 12 living in single parent, under-resourced households on Cape Cod and the Islands. Committing to just a few hours a couple of times a month as a Big Brother or Big Sister can make a world of different to a young boy or girl. Big Brothers Big Sisters offers volunteers TWO fun and fulfilling ways to get involved! We’ll pair you with a student who shares your interests. Spend your lunch hour one day a week during the school year with your Little Brother or Little Sister. Ask your HR department about volunteer time, flex time, or comp time. We’ll pair you with a child in your community, aged 7-12. This is a self-managed program, meaning you and your Little decide, along with the Little’s parent or guardian, when and where you want to spend time together. Go fishing, ride bikes, or volunteer together. The possibilities are endless! For more information please come speak with BBBS staff and volunteers at the Sandwich Public Library, Wed. March 11th from 6-8pm. If you cannot attend the event, check out our website www.bbbscci.org or call 508-771-5150 for more details!